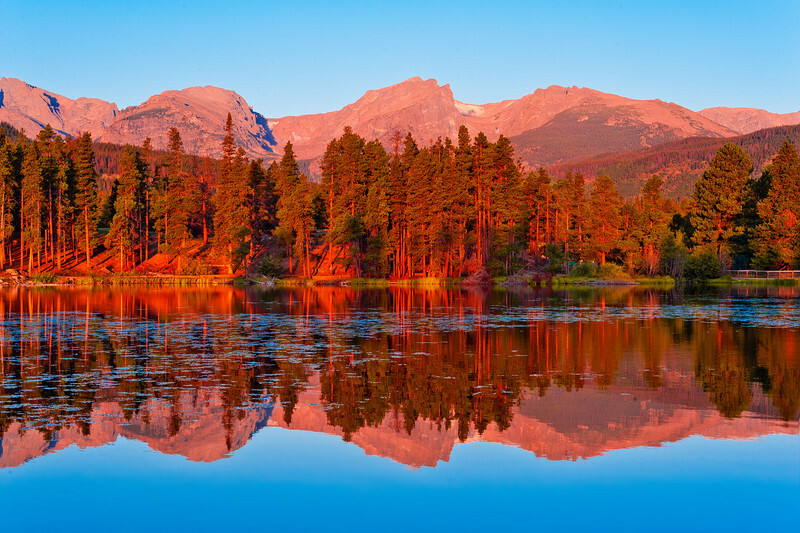 Sprague Lake in Rocky Mountain National Park is one of those iconic National Park sunrise locations that is quite glorious. It’s very easy to find, and the placid morning water makes for some great reflections. When researching what I wanted to photograph in Rocky Mountain National Park, it immediately jumped out at me. So, our first morning there, we made the trek into the park at around 4 a.m., and found this spot. If you’ve ever photographed a sunrise like this, you know there’s a lot of sitting around intently waiting for “the right” sunlight. As I was waiting for the light to hit with my tripod set-up just as the water’s edge, two elk wandered near me. They eventually passed within 10 feet of me and wandered into the water right in front of me. Deer are pretty common in our area (our brilliant dachshund tried to chase one in our backyard last year), and elk are basically more awesome versions of deer, so it wasn’t too intimidated, but it was pretty awesome to see these beautiful creatures up close. I remained in my spot and took photos of them as they wandered around me before quietly leaving. Not much to this one from a technical perspective. This was shot with my Nikon D700 and the Nikon 50mm f/1.8 lens. Normally, I wouldn’t use a 50mm lens for landscapes, but after a few minutes of using my the Nikon 24-120mm f/4 VR lens and CHEAP-O® Vari-ND Filter, I realized that I was shooting at about 50mm anyway, and that the ND filter wasn’t doing anything. The water was already incredibly placid and the sky was cloud-free, so there was no use in using the filter…accept to make my images a tad softer. So, I switched to the slightly sharper 50mm for the rest of my shooting. Post processing is relatively uninteresting here, I increased the recovery to restore detail to some areas with color bleed from the vibrant layer of sunlight and tinkered with the white balance and tint to get the colors how I wanted them. I followed that up with a quick curves adjustment layer in Photoshop, where I also used the healing brush to remove some dust specks from the sky. Do you ever get up to see or photograph the sunrise, or is your sleep too valuable? I figure I can always sleep later, but the sunrise in each unique location I visit only happens X number of times while I’m there. If there’s an interesting sunrise to be captured, I’ll do just about anything to capture it. For our Yosemite trip, I already have plans to stay up through the night when I first arrive just so I can hike out to see and photograph the sunrise! Share your thoughts on the sunrise…or on anything else…in the comments! One lucky commenter might win a bag of Doritos! Tom -So glad that you have a site now to feature the shots that don’t make it to your Disney blog or flickr. These are all GORGEOUS. I think I got used to your Disney shots and came to expect what Ryan and Cory refer to as “Your signature look.” To see you actually venture outside of a Disney park and come back with these beautiful landscape/cirtyscape shots is really exciting. Definitely adding Rocky Mountain National Park to my list of places to shoot in the not so distant future. As for getting up early and waiting for the right light, I spent three mornings in a row getting up at 4:30 AM in Reno trying to get to Lake Tahoe in time for the sunrise and came back with virtually nothing that I wanted to use. Ditto with my early mornings at Yosemite last year as I drove for an hour to get to Mono Lake. But there have been many mornings out here where that early morning has paid off in a big way at Laguna. Glad this one paid off for you! Glad you’re liking the diversity. I think most of the photos here have that same “signature look,” although I’m going to experiment with other styles, too. I don’t like things like textures and other gimmicks, so I won’t be adding those to photos, but I will be trying other styles. RMNP is a great place. You should definitely visit. I know you’re just as crazy (if not crazier) about sunrises than me, so I’m not surprised that you’ve chased one or two in your day! Very pretty. It almost looks like you had a some red cellophane over the middle of the lens. I confess to not getting up early enough for sunrise on a lot of vacations. We did stay once at Hilton Head in a condo on the west side of the island where we got a lot ff very pretty sunsets, however. Wow! Tom, your photo left me feeling warm and happy this morning. I appreciate it. Such an AMAZING picture. And, since I don’t usually comment, I’d like to say, in general, your photos always seem to evoke emotion in me (especially the Disney ones), and I’d just like to say Thanks. Thank you for the kind words–I’m glad that this photo prompted an emotional response for you, and I’m even more glad that you enjoy the blog! What a great sunrise shot. The blue of the sky reflected in the still water is captivating. I’ve never gotten up early to capture a sunrise, but mainly because I don’t have any grand vistas to photograph around me.I am sure that if given the opportunity to shoot in the Rockies, I’d make the most of it and be out there every morning. Have you ever gotten up for the sunrise at Walt Disney World? It’s beautiful there, too. Especially around Crescent Lake!